Substantially improved SC connector with its ease of handling. When disconnected, the shutter at the end of the connector closes to prevent soiling or damage to the ferrule end face. 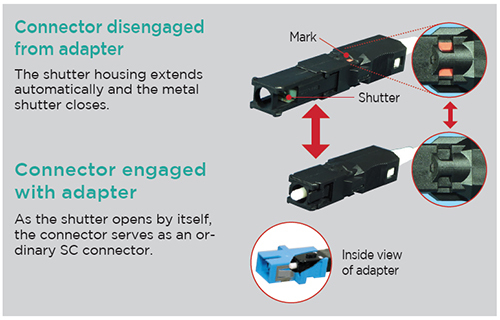 When the connector is engaged, the shutter selfretracts in the connector. Designed not to allow leakage of light, this connector prevents the light from entering the eye. The SC connector with shutter accommodates any cord or cable that can be attached to an SC connector.